Hyundai Heavy Industries said Tuesday it has signed a contract with the Defense Acquisition Program Administration for depot maintenance of the third unit (1,800 tons) of the Chang Bogo-II submarine. 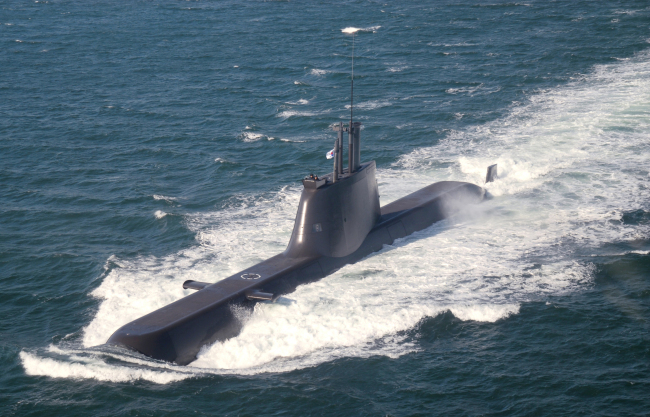 Under the contract worth 55.5 billion won ($49 million), the Korean shipbuilder is slated to deliver the submarine to the Korean Navy by 2020. The depot maintenance project is designed to replace and repair parts of the interior of the submarine. Hyundai Heavy Industries already completed depot maintenance of the first and second units of the Chang Bogo-II submarine, based on its experience of building six submarines of Chang Bogo-class. “We are currently carrying out the depot maintenance project for the second Chang Bogo-II submarine. We will also successfully finish this third submarine to secure the key military strength of the Korean Navy and to lead the depot maintenance industry,” said Nam Sang-hoon of HHI’s special ship business division. On Thursday, HHI signed a contract with the Defense Acquisition Program Administration to build two convoys.